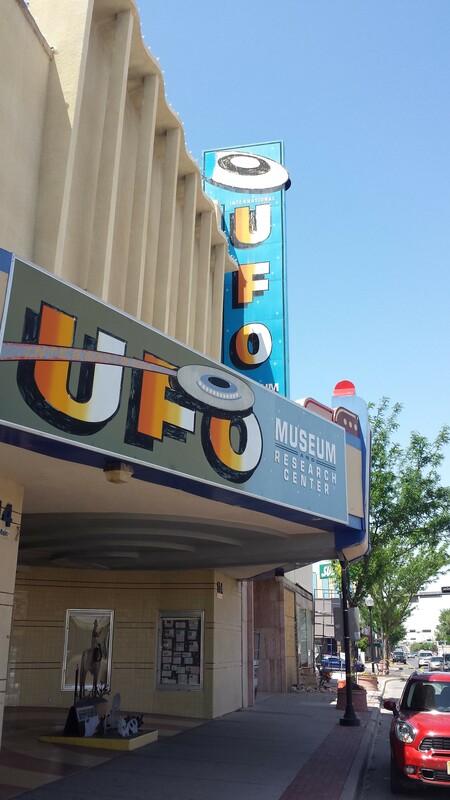 Living in Albuquerque, New Mexico has felt like living on a different planet. From the altitude to the blazing sun to the bone-dry air, Boston may as well be across the galaxy as it is across the continent. Forecasting here has been quite a challenge too; little microclimates form around the mountains that are not picked up by weather models. That being said, its a joy to explore the desert southwest. Recently I drove the lonely roads across the state down to Roswell and Carlsbad Caverns. I would describe the experience as “beautiful desolation.” This state is so empty, but that doesn’t mean there’s no beauty (or weather!) to behold. A sign inside Carlsbad Caverns describing the weather inside. Weather on the surface changes according to the time of day and the seasons. But as you descend deeper into the cave, conditions stabilize. The temperature of the air and surrounding rock here remains at about 56 F (13 C), with a relative humidity of about 90%. Changes in temperature and barometric pressure on the surface generate air currents in the cave. Visitors standing at this point (about a 20-minute walk inward) often feel a breeze, especially in winter. I have to say, coming from the 90 degree heat outside, the 56 degree temperature was just perfect for long walks through the cave. 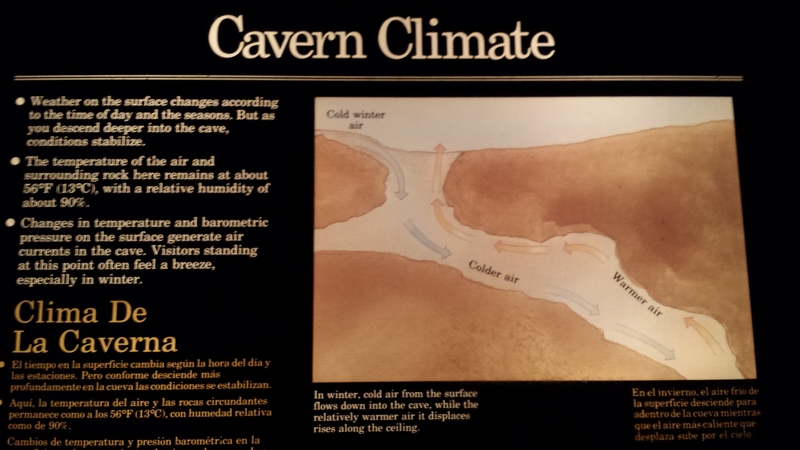 But what I wanted to point out here is the flow of cold air down into the caverns. Cold air is denser than warm air, and thus can move unimpeded down into the cave. Think here of a strong cold front barreling across the plains, uninterrupted by the warmer air ahead of it. In order to conserve a consistent amount of mass inside the cave, air must escape back out at the same rate; this is the rising warmer air. Because it is less dense, it sits above the cold, sinking air and moves along the cavern ceiling to the mouth of the cave. High pressure and cold fronts dominate this region’s weather during the winter, and both would send cold, dense air deep into the caverns. Carlsbad Caverns was absolutely beautiful. I would encourage anyone with a chance to visit to check them out. Although I could not see it, I hear the nightly bat flight during the summer is a must-see. I will include some more pictures at the end of this post. The next two photos are of dust devils. I took the first one along the highway near Roswell and the second is a more impressive shot I got off the internet. 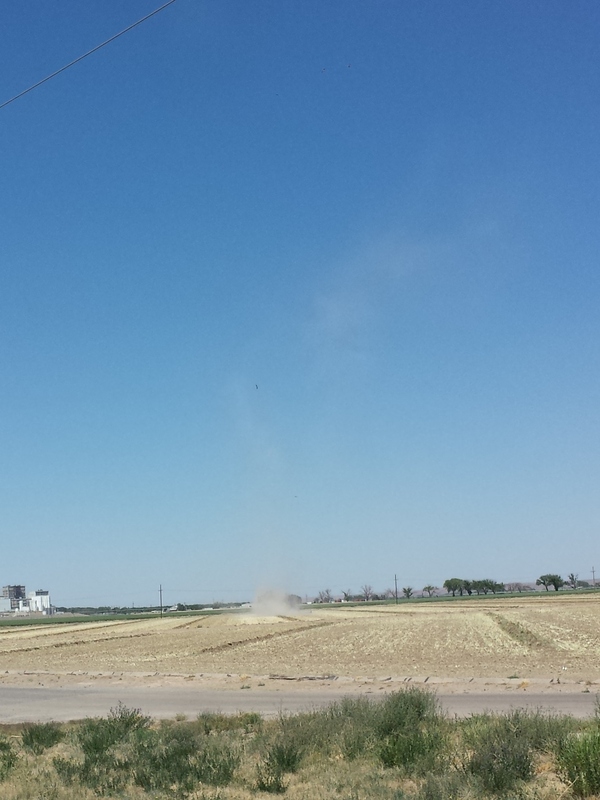 An admittedly unimpressive shot of a dust devil. Dust devil, Wirrabilla Farms, Birchip, Victoria, 12 March 2006. I saw several of these during my drives but could only pull over to get a shot of the one. So what are they? 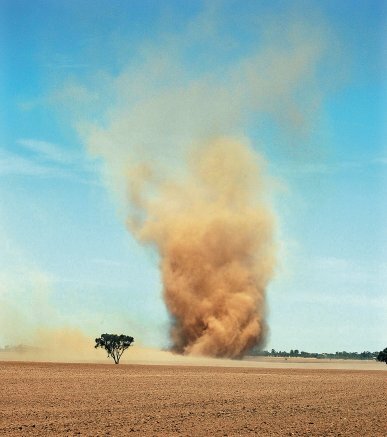 Dust Devils are a swirling, column of air but they are not tornadoes. To explain how they form, lets start with the crude image below from weatherquestions.com. These “convective rolls” are caused by wind shear. (Yes! Another post with wind shear.) Once again, wind shear is a change in wind direction or speed with height. In this case its strictly speed, friction keeps wind speeds at the surface lower than they are immediately above. This causes the rolling motion shown. Another poor image. 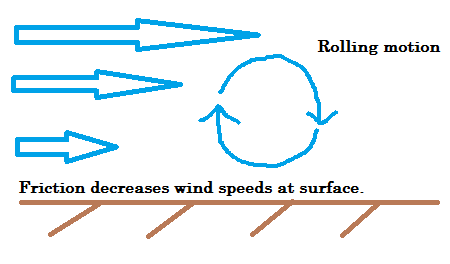 This one shows how friction can create a rolling motion. These rolls become tilted and vertical when the comes across a thermal. A thermalis a column of of rising air where warm, surface air rises into a pocket of cooler air above. Thermals are caused by uneven solar heating of the surface and are what birds and paragliders use to stay in the air. 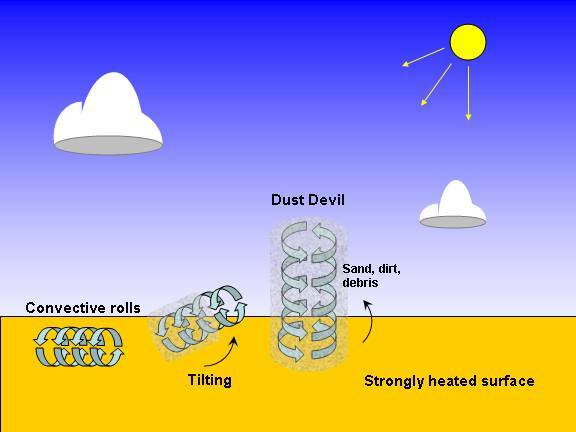 Once a dust devil is vertical it can begin picking up dust and sand (and larger items) and acquire that tornado-like appearance. Dust devils can very in size greatly and be up to 1oos of meters wide and over 1000 meters tall. They can last quite a few minutes, too. I saw the one that I grabbed this image of for about 5 minutes. 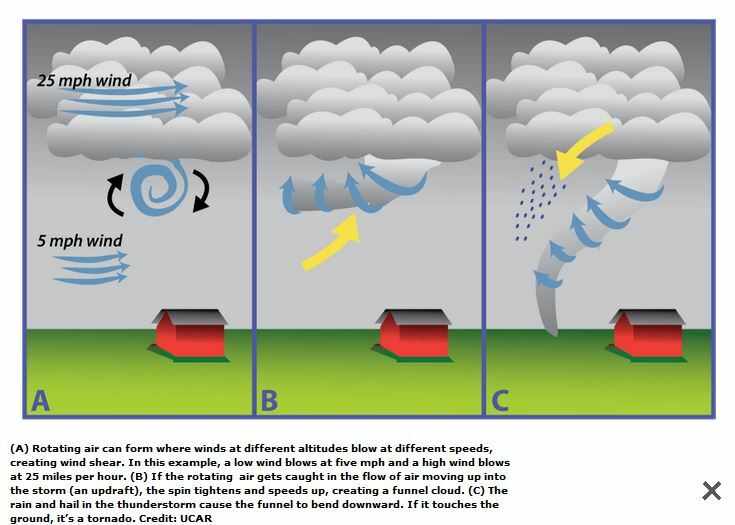 Just for comparison’s sake, here is a quick look at how a tornado forms. While both situations begin with a horizontal, rotating tube that is turned vertical, the environment in which this occurs is completely different. With a tornado, the wind shear is above the surface and there is an updraft up into a storm cell. I’m not suggesting that you would think that a tornado could form under a cloudless sky, its just to fulfill your intellectual curiosity. So that’s a brief look into life as a meteorologist in New Mexico. Perhaps soon I can discuss the coming El Nino and is implication on the drought-ravaged southwest.